Hake is widely regarded as one of the best fish in the whiting family. Its white flesh is soft when raw, but turns firm with a medium flake when cooked. First time hearing of hake? It can be intimidating to think of what you can do to an unfamiliar fish, but hake, in particular, isn't really that hard to figure out. Part of the cod family, it can be found frozen, smoked, fresh or salted in supermarket shelves - most commonly in the form of steaks. It is generally sweeter and more delicate compared to cod, and conventional ways of preparing this fish (as the Europeans do) would be grilling, baking, or by good old pan-fry. It handles robust flavors very well, so feel free to liberate those capers, paprika and horseradish powders from your kitchen jars! Tips to buying hake: A good hake product is one with white flesh free from any sign of browning, grayness, and dryness. I've recently gotten very inspired to cook, and this subsequently led me into creating a recipe for a fish dish that is effortless to prepare, delicious, and artful. 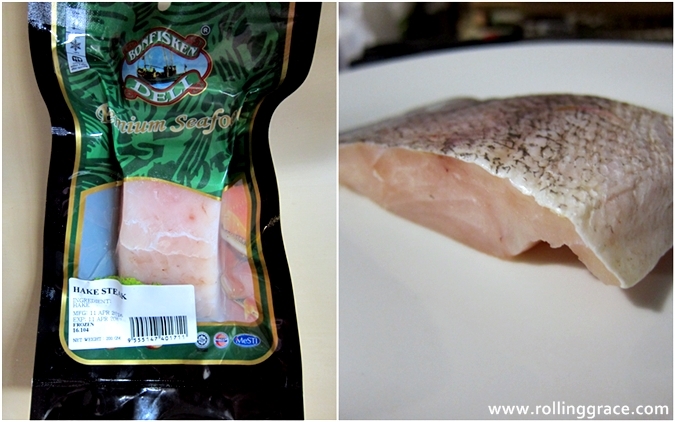 The recipe calls for a quality hake steak, which I am using from Bonfisken Deli. Horseradish is the key constituent of the sauce - surprising your taste buds with an unexpected kick with every bite. Sautée fish in hot butter for not more than 3 minutes on each side. Remove from pan and place on a plate, along with hot oil. Place horseradish, garlic, yogurt, spinach, cilantro, salt and pepper in blender. Blend until mixture is smooth. To serve, add garnish or green of choice. This recipe is easy and simply delicious. Happy cooking! Wow Grace, that dish looks like a 5-star dish!